Hoka went hard and alone against the "minimal" run shoe grain with oversized super cushy midsoles. 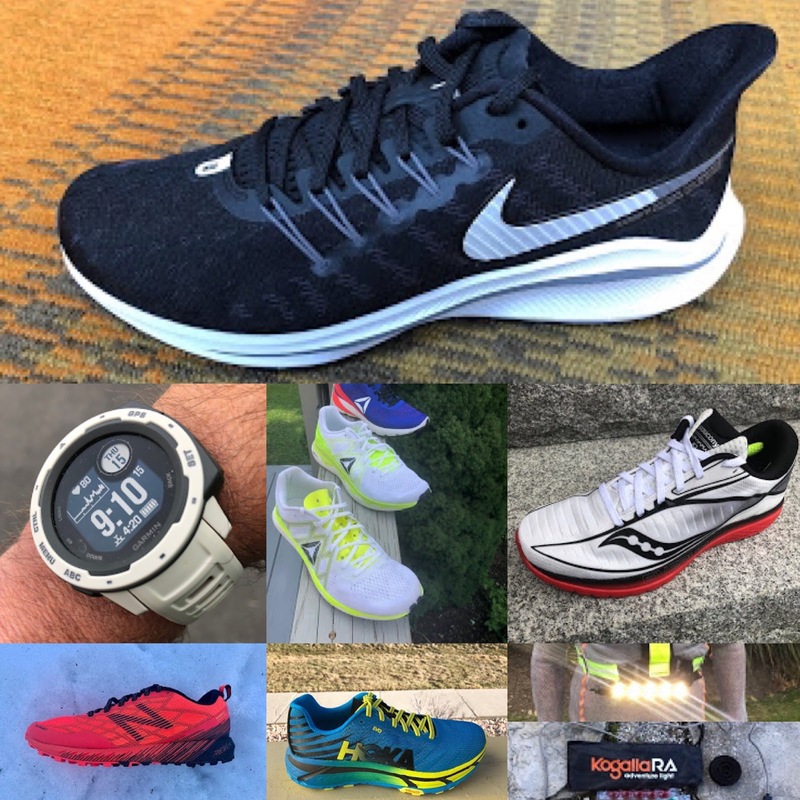 As the dust settled on the barefoot, near barefoot craze Hoka had created a growing market for super cushioned shoes and now lighter and a bit less "maximal" shoes. I previewed the Summer 2014 Hokas here and while the 7.9 oz Clifton road shoe also launching now looked tempting I really wanted to try the new and supposedly more responsive RMAT midsole material of the Huaka. The Huaka is light, flexible, and with the new RMAT midsole responsive and fast. Since the very first Hokas I have been waiting for this shoe having tried pretty much every model. The Rapa Nui reviewed here got close but at speed didn't quite have the pop due to their softness to make me want to race in them on the road and felt somewhat unstable in the forefoot on downhill trails. 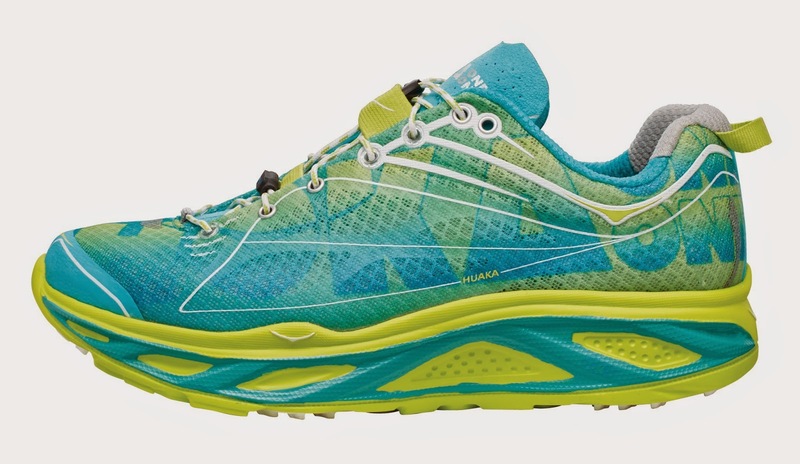 Hoka is also launching the Clifton a somewhat lighter shoe for roads with a more traditional CMEVA midsole. I wanted to try the RMAT as I heard it was firmer and more responsive. Lightly lugged but with wide ground contact, Huaka can find a home on both the roads and most trails. The harder rubber wear patches are in my view perfectly placed with the outsole appearing to have 3 different densities of rubber with the gray the densest. The cutouts lighten the shoe and improve flexibility. Update 7/14: As with most Hokas I have run in to date the outsole durability is not great especially on pavement, a trade off for the light weight. Shoe Goo will soon come out. What is not lost is the characteristic superb Hoka cushioning now expressed in the somewhat firmer and bouncier new RMAT foam. 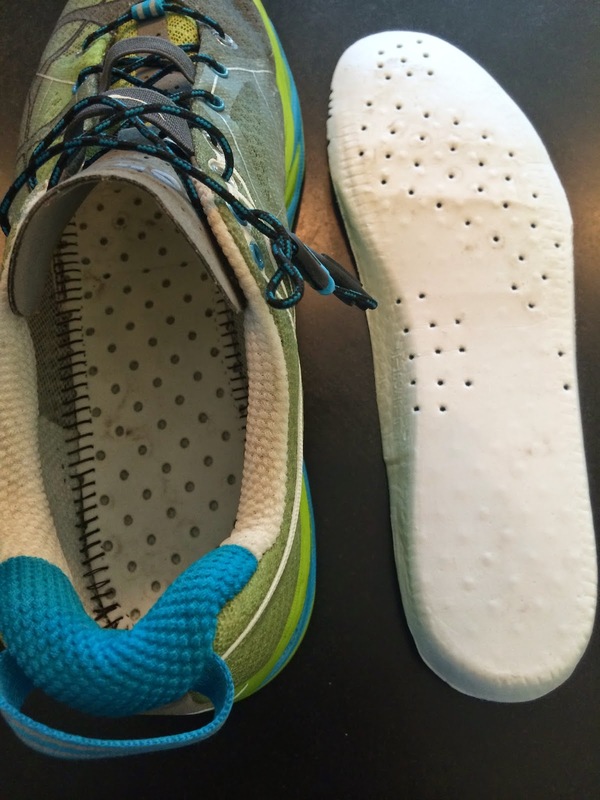 A more "natural" running shoe, in that it has a 2mm heel to toe drop vs. more conventional 10mm plus it did not, as pretty much any shoe of less than 4mm drop does for me, have that the "heel" was missing feeling when I got tired. I ran Mt Washington Road Race, all uphill Saturday, receiving the Huaka while at the race and ran the BAA 10K in the Huaka the next day in Boston, right out of the box. They were superb. No PR on tired legs but felt smooth striding from heel to toe and responsive at speed. The smoothness was somewhat similar to the Pearl Izumi N1 Trail, but with far more cushion in the forefoot in particular. Probably not my first choice for a 5K or 10K, where I often go for the adidas adios boost with its soft heel and firm forefoot but certainly a great option for a half or full marathon, particularly if the course is hilly. I like a firm stable forefoot and while the Huaka has 25mm of foam in the forefoot, far more than my adios boost with their 13mm, I did not find them either unstable or slow responding. Today I took them out for a recovery run, no soreness from the prior day's race even though I was 15 so seconds slower than my usual pace. I ended up faster than the usual post race plod. Quite remarkable. How would I characterize the cushion? Somewhere between the bouncy energetic adidas boost material and the firm yet a bit harsh New Balance Fresh Foam. This tells me, and top trail runners such as Sage Canaday, 3d at Mount Washington in his Huaka Saturday as well as many trail podiums prove, that they will also be a fantastic platform on the trails for the agile. The rocker when combined with the flexibility, and they feel to me a bit more flexible than the Rapa Nui, makes this a shoe that will climb the steeps better than the conventional Hokas such as Mafate and Stinson. These last two put a premium of driving up, lifting with the knee when slope exceeds the stiff sole's rocker. 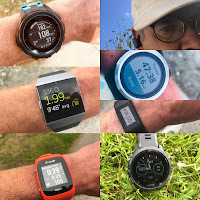 While I have not yet been on the trails I suspect the firmer RMAT will make them more stable than the Rapa Nui, which are somewhat mushy unstable in the forefoot on downhills. Update 7/14: have now run significant miles on Utah smoother single tracks and the Huaka is outstanding.Very stable on downhills despite minimal upper due to firmer RMAT mid sole. They climb exceptionally well. I have also run 2 fast half marathons in the Huaka. One was a dirt road half with lots of rollers, the other a downhill pavement half. This last 2 minutes faster than last year (in Rapa Nui) on a hot day. The Huaka is a superbly versatile trail road hybrid. Only compromises a bit to much shoe for shorter races and potentially for many to little shoe for super technical trails. The upper is a very fine mesh with multiple thin welded on overlays. No seams except at the front of the laces. The fine mesh will keep out dust for sure. The overlays are very thin and I have some concern about their durability on rough trails, not as much for the roads but time will tell. This is after all a racing Hoka. I noted that even though I dried them overnight after the 10K race, where I did dump some water on my head, they were still damp the next morning. 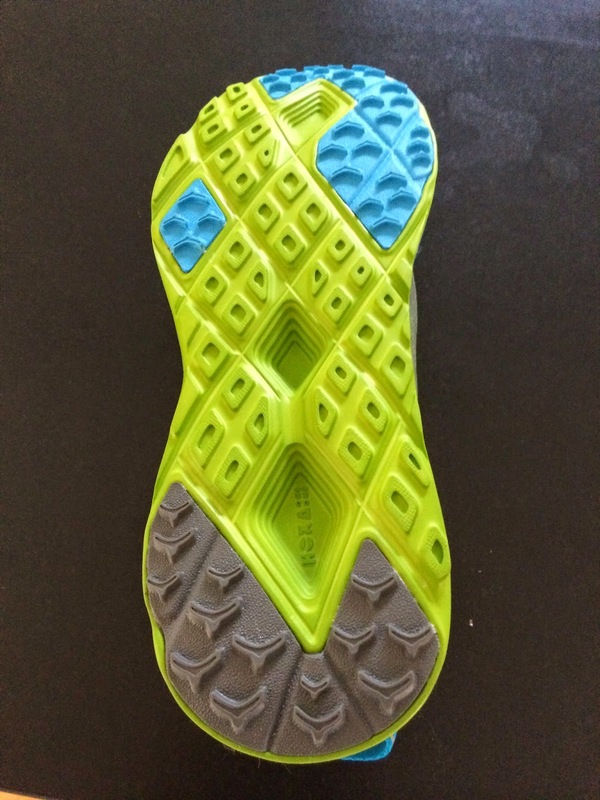 I would not call the outside mesh particularly pliable or soft and it is a bit "baggy" in the front midfoot when standing, not noticeable on the run and I think just a function that the upper is somewhat plastic-y stiff in texture. This said the upper wraps the foot just fine if a bit loosely in the heel area even with the speed laces which I do not particularly care for. I often find myself fiddling with them to get the right tightness. The shoe is also supplied with standard laces which I think I will install I have now installed, better wrap as a result. The upper is supportive but is more minimal in its support overlays than many trail shoes have. While I have not been on trails yet I would call it an upper for smoother trails or agile runners on rougher trails. The midsole has holes as does the sockliner. I do not see "drains" to the outside. Sockliners can affect fit and I found the Huaka's fit me true to size, maybe a quarter to half size big with a small amount of heel slippage only when walking, may be due to the sockliner or potentially the heel collar being a bit wide and the tongue being un padded at the top. Hoka has told me that other retail pairs will come with a slightly thicker sockliner, the included one being among the thinnest I have ever seen. I think this will make the fit perfect for me. I have tried a thicker insole from another shoe which does improve fit. Characteristic Hoka One One cushion and geometry in a go fast, low drop (2mm), low weight (8.9oz) trainer racer for roads and trails. Great for long road training miles, longer races, smoother trails, and for agile runners on rougher trails. MSRP $150, quite steep but worth it! My favorite shoe so far this year for both road and moderate trails. Generally available in the US now. This review will be updated as I run more miles in Huaka. Please Support My Blog. Consider purchasing The Huaka or its close cousin the Clifton (a bit lighter and with a somewhat softer EVA sole) at Backcountry, via the link below. How does the cushion and responsiveness compare to the Skechers GoRun Ultra? Great question Rod as I like the Ultra a lot and in fact am doing wear testing on future versions. Ultra is somewhat softer in the heel due in part to the Ultra having a midsole that is the outsole; a bit firmer, thinner and more flexible in the forefoot. Sam got a chance to do some trail runs with these shoes (10 and 6 milers) and was very happy with the performance on the trails both going up and going down and it had great traction. The road ride was smooth and real nice. I was amazed as to how fast I was going and it just didn't feel like it. Agree with you Sam on the feel of the Ultra vs the Huaka. You also nailed the feel of the fit as well. I wear 11.5 in all HOKAs and in this shoe as well. I use the lighter Clifton for speed work. This is a great shoe and a game changer for HOKA. Thanks Harris. It is one great shoe. I have not been on trails yet with them, saving them for smoother UT trails when I get out there. I put a thicker insole in mine from GoRun Ultra, production pairs will have a thicker one and this improved heel fit as did installing normal laces. Have you run in Kinvara lately? It's been a while for me but the Huaka while a bit heavier seems more cushioned,more stable, yet also more responsive especially in the forefoot where I have found the Kinvara kind of mushy unstable upfront. Sam could not get the Kinvara to work for me too narrow in the forefoot and the shoe just felt weird. You need to try the Clifton a great road shoe very light weight. Bret Rivers ran in the prototype trail version for the Western States 100 (he came in 9th). Looks like a great shoe that I cannot wait to try. @ Harris: I am currently trying to decide between the Huaka & Clifton to train for and run an upcoming 1/2 marathon -- which would you recommend? Kathy I have only run the Huaka to date but am seeing comments from folks who have run both. Clifton is a softer feel. The Huaka is firm but that is really a relative term as they are a true Hoka, very little road shock... yet they are far more responsive than any of the other Hokas I have run in and flexible and of course much lighter. I have now run a downhill road half, a dirt road half, many miles or road, both somewhat technical and smooth trails and they handle everything brilliantly and I was fast too! What are you running in now and what is your goal time? Do you also run some trails? Thanks for the review. I am new to Hokas and trying to decide between the conquest and huaka used primarily be for training and half marathons -- I don't have "race" shoes. Is the primary difference between the two just weight? I'm 5'3, 125 lbs and run 20-25 miles per week and switching from Nikes. Yes Bonnie weight is a big difference between Conquest and Huaka. Associated closely with weight is the stack height and heel toe drop. The Conquest is 29 mm heel 25 mm forefoot, 4mm drop. The Huaka are 27mm heel 25mm forefoot, 2 mm drop yet despite being similar including same super RMAT midsole Huaka for women 8 are 7.8 oz vs 10.3 for Conquest. A good part of difference I assume is lighter upper on Huaka as well as carve outs in midsole which also make Huaka far more flexible. No contest. I did not even consider Conquest and have been absolutely delighted with my Huaka. My current shoe of the year for BOTH road and trail. A superb Hybrid. Clifton another alternative What Nikes do you run in now? Thnx for the update having run in the Rapa Nui, Clifton and Huaka which one do you prefer? Have run in the Rapa Nui and Huaka, not yet the Clifton. Prefer Huaka by far to Rapa Nui. More stable esp. forefoot on trails, more responsive, lighter, firmer. I am pretty sure that while I will like the Clifton I will still prefer the Huaka as I like good cushion but not soft cushion. Holip, hoping to get a pair of Clifton soon. I tried the Fresh Foam 980 Road and they were OK but not for me. Too firm and stiff, not super lively. Trail 980 different story and after seeing think V2 of Fresh Foam will be far better. Never looked at Conquest. To much shoe as I felt that much RMAT would be to stiff and dead feeling. Huakas are firm but also super lively and flexible although 25 mm of forefoot while flexible is not exactly close road feel! If your road runs are hilly ideal shoe. Also very good trail shoe if not to muddy or super rocky. As of right now Huaka my "shoe of the year" for both road and trail. Thanks so much Sam for the thoughtful reply. I ended up getting the Conquest because my local running store did not carry the Huaka. I've run in Conquest twice -- first time both feet went numb -- from ball of foot to toes (even stopped half way through run to loosen shoe) and the second time just my right foot went numb. Called Hoka and they said that it takes time to "break in" which I was surprised to hear given today's materials. I'm likely going to return them and see if the store can special order me a pair of Huaka as that I really do want to like Hoka. But before I do so, is there a "break in" period? Or perhaps it's because I'm transitioning from Nike Pegasus which has more of drop? Again, thankful for any guidance you can provide. Feet numb might be because they are fairly stiff and may take some getting used to rocker effect. Another potential issue and one that my daughter had moving to Brooks Ghosts from a firm pair Mizuno Wave Riders is that soft may not work for you as she needs more stability due to a high stiff arch, she was a dancer for years. The Huaka is firmer and thus might helpwith the numb feet issue. My wife just got Clifton today and I tried a pair on. Very nice shoe and super light. I think the Huaka as it is a bit firmer is a bit higher performance and can serve as a smoother trail hybrid better than Clifton but if you run roads you likely would really like the Clifton too understanding that its softness compared to Huaka may be an issue. I tried the Clifton on t he store treadmill and they were definitely softer especially in the forefoot than the Huaka. Don't get me wrong the Huaka really cushion road shock incredibly well but not in a mushy soft way IMO. One more thing on Clifton, my wife sized down half a size. On Huaka she sized down half a size likely due to goofy speed laces. I was true to size and cut the speed laces off and put a bit thicker insole and was fine at true to size. So grateful for the great insight. Thank you. No improvement after 4 runs in the Conquest. My local running store was great in enabling me to exchange for the Cliftons. LOVE the Cliftons -- super light. I ran in them for first time yesterday and wasn't sure if it was the shoes or just my excitement for the Cliftons, but I ran a PR for a 5K.